INTERESTED IN CASH FLOW – INVEST IN SALTWATER DISPOSAL WELLS! 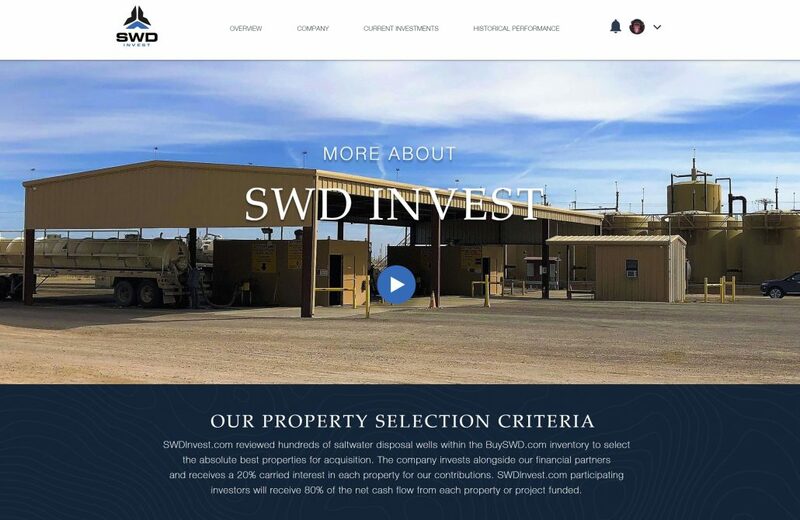 BuySWD.com is launching SWDInvest.com in Q1 2019 to provide qualified investors with opportunity to own a piece of profitable disposal wells. Many of our SWD properties available for investment have pipelines and are situated in the heart of continuous drilling activity within the Permian basin. These properties are generating 20%+ annualized returns based on current disposal volumes. Why invest in high-risk oil and gas drilling ventures when you can own a piece of an existing asset that is generating rock-solid returns! If you are looking for cash flow, and want to receive more information regarding the saltwater disposal industry, contact us today! This website is available for information purposes only and does not constitute an offer or sale or any form of general solicitation. Any such offer will only be made in compliance with applicable state and federal securities laws pursuant to an offering memorandum and related offering documents which will be provided by an investment sponsor to qualified prospective investors upon request. Prospective investors should review any offering memorandum carefully, which includes important disclosures and risk factors associated with any investment in saltwater disposal properties. In addition, prospective investors are encouraged to consult with their financial, tax, accounting or other advisors to determine whether an investment in a saltwater disposal property is suitable for them.